We have just released BETA 3 for the new productivity application ActionPad for BlackBerry®. ActionPad’s design was inspired by the simplicity approach which made NextAction! 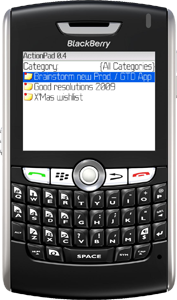 and TaskMaster so popular amongst thousands of BlackBerry® users. Quick: 2 click memo creation. Category quick switch: known from TaskMaster(TM) and NextAction!. Export memo to / send memo via EMail. 3 Font sizes: small, medium, large. 100% compatible with internal Blackberry® Memo(TM) Application. Functions: add / edit / delete memo, add / delete category. This beta test is totally free of charge and open to everyone. Please feel free to tell this anyone you know if you think they could make use of ActionPad. We would like to get as much feedback as possible! Previous Previous post: NextAction! 3.0 Professional Edition is now available!